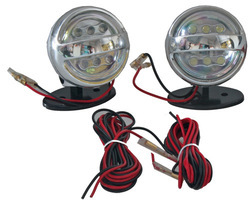 Round compact LED fog lights for tight spaces. Each LED fog unit includes 6 bright white LEDs. These are perfect if your vehicle has fog light holes and you want to fill them up with something compact for accent lighting. These fog lights are perfect for decoration purposes. Includes bracket that can be mounted onto a surface.